retailers in making a better presentation of their fabrics. With 3D Grid and Shading tool you can reach the effect of a photographed image. Adjust the applied fabric with 3D grid to make it look realistic. Use shading to take the shades of the original photo for depth effect on the image. No need for expensive and time consuming process of making products and photographing them. Batch function allows you to make and save thousands of product photos draped with different textures automatically. 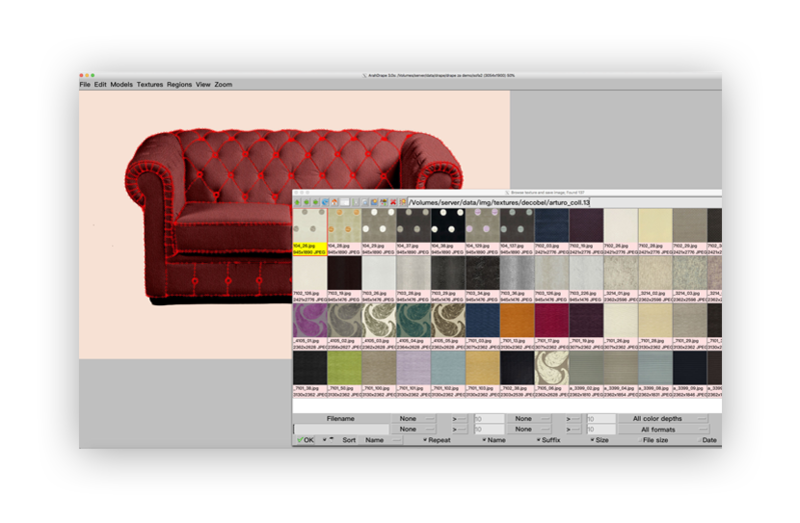 Just select the texture directory, click on the first one, and the software will start with the process of draping and saving. Show your product on-line with product configurator. 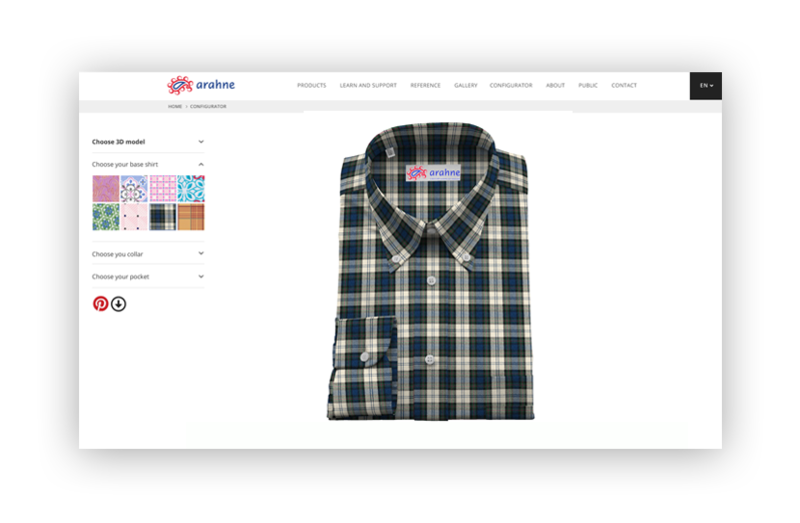 Use your product image and different fabrics to allow customer to change the fabrics on the product on-line. Product configurator will definitely spice up your website and attract potential clients. Use it on the desktop computer, tablet or mobile phone. Check our product configurator here. What kind of objects can I texture with ArahDrape? What kind of starting image do I use? You need a photo of the object you wish to texture. For best results choose a photo with white fabric or solid light color fabric. Dark or printed fabrics won’t work so well. Low resolution photo will result in a low quality outcome. What resolution and what format of the starting image do I use? Can I use my sketches as a starting image? Yes, texture mapping your sketches will give them a 3D effect. What kind of texture do I use? Use any kind of pattern or texture saved in standard image format (jpg, png, tiff, bmp,…). You can create fabric simulation in ArahWeave, download them from the web or scan them. The size of one seamless repeat is sufficient. ArahDrape will automatically repeat the pattern. Make sure that the pattern or texture is in seamless repeat (tiled). Can I scan the pattern, fabric or texture? Yes. Scan a size of more than one repeat if possible. Use ArahPaint or other image editing software to put the image in repeat. How long does it take to make an ArahDrape project? It depends on the complexity of the project. The estimated time for a skirt would be 15 minutes, for a shirt 30 minutes. Once the regions are outlined and the grids defined, it will take you less than a minute to change textures, or to change the angle or size of a texture. Yes. Go to Download > Software demo, to download the latest DEMO version of Arahne software. It includes ArahWeave (CAD for weaving), ArahDrape (texture mapping) and a full version of ArahPaint (drawing in repeat). If you need help with the installation contact us at arahne@arahne.si, or call us on +386 1 439 5280 between 10 a.m. and 6 p.m. (Central European time, GMT +1). If you use virtual machine, you avoid problems with unsupported hardware, as virtual machine will use drivers which are already working in Windows. Using virtual machine is better, if you rely on some Windows-only programs for your daily work, and you don’t want to dual boot your computer.